Westminster United Church is located at 745 Westminster Avenue, on the corner of Westminster and Maryland Street. 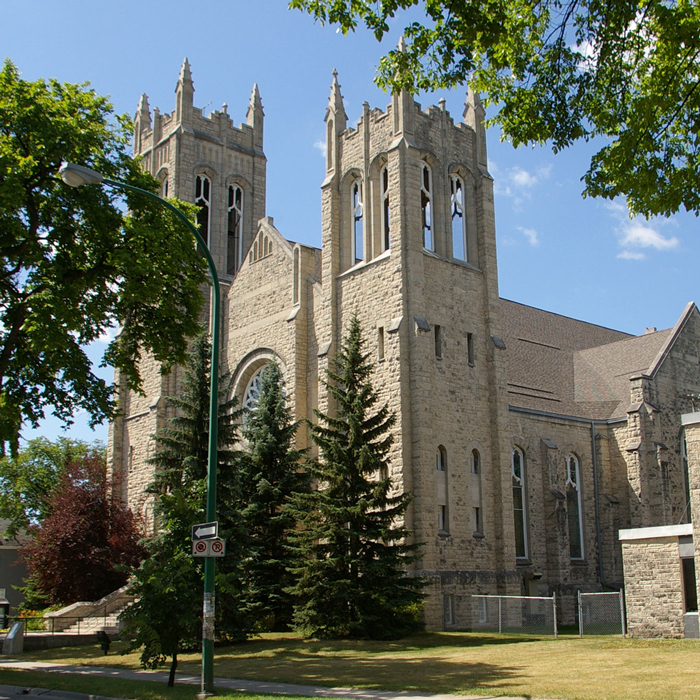 The church is situated in the beautiful Wolseley neighbourhood, bounded on the East by the cafes, diners, shops, and condos of Sherbrook St. On-street parking is available nearby, along with commercial parking at Misericordia Hospital Parkade (a short walk from the church). The front entrance is on Maryland Street. A side entrance on Westminster Avenue has wheelchair access, which serves the main floor of the building and two wheelchair-access washrooms. Lots of people, lots of cars. Finding a parking space around Westminster United Church can sometimes be a problem—especially at times of special services and on concert nights. Consider public transit as an inexpensive, comfortable, no-hassle alternative for getting to Westminster. The church is located on the following Winnipeg Transit bus routes. Live elsewhere in the Winnipeg? Your nearest bus route is probably a simple transfer to one of the above routes. Check the Winnipeg Transit bus route map for a connecting route.